IBM® Intelligent Operations Center is an integrated solution, and a continually evolving platform and set of capabilities. The platform grows as the capabilities increase over time, and new interfaces and integration points are introduced in each release. The purpose of this IBM Redbooks® publication is to guide planners, architects, and implementers through the options that they have, to take advantage of the new capabilities and maximize the benefits of moving to the new release. This book considers what has already been deployed with IBM Intelligent Operations Center V1.5, the benefits of the new version (IBM Intelligent Operations Center V1.6.0.1), and the best way to take advantage of the new capabilities as you transition. IBM Intelligent Operations Center has several integration and extension points for the previous and current versions of the product, which points are documented and described in this book. This IBM Redbooks publication describes options and considerations for the best way to migrate customizations and benefit from the new architecture. Thorough details about the differences between the prior and new versions of the product are provided, to enable a clear understanding of migration choices, options, and preferred practices. 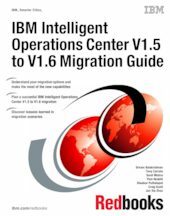 This book includes descriptions of the trade-offs for each migration option, and in-depth information about data flows, available tools, and scripting changes that might affect existing IBM Intelligent Operations Center installations. Line of business managers or stakeholders who are interested in understanding the new features in IBM Intelligent Operations Center V1.6, and who are looking for information about how to plan the migration of their current IBM Intelligent Operations Center V1.5 environments. Architects who need to understand the effect that IBM Intelligent Operations Center V1.6 will have on the architecture of IBM Intelligent Operations Center V1.5 solutions. IT specialists and product specialists who are responsible for implementing the migration of a solution based on IBM Intelligent Operations Center V1.5 to a V1.6 solution. Readers of this book will benefit from the IBM Redbooks publication IBM Intelligent Operations Center 1.6 Programming Guide, SG24-8201.